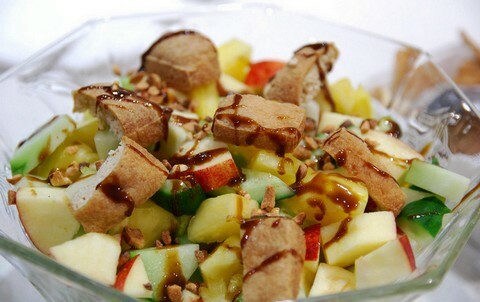 This is my version of fruit rojak salad which is loved by all my family members. There are several popular versions of rojak salad (Chinese, Malaysian, Indonesian) and each one of them taste great. I love to include fruits in salad preparations to increase both the nutrition and fiber quotient. If you already have rojak sauce ready, you can make this salad in quick time though I'll highly recommend preparing this sauce fresh to get the best results. One can make subtle changes in the salad ingredients to use the available fruits in the kitchen. You can refrigerate it for about 15 minutes before serving. Rojak fruit salad can be served without a main course and can be relished as it is during tea time. Enjoy this fruity and delicious rojak salad which consists of several fruits and is flavored with a tangy and sharp dressing for an irresistible texture. Add oyster sauce, tamarind paste, shrimp paste, pepper paste, sugar and water in a small bowl. Mix and whip well with a wooden spatula till a smooth sauce consistency is achieved. Keep aside. Take a large salad bowl and add apple, white bread, cucumber, pineapple and green mango in it. Mix and toss well followed by a generous drizzle of rojak sauce. Sprinkle ground roasted peanuts in top and serve immediately.